Amongst the vast range of tracked and wheeled armoured vehicles on display at Eurosatory this year, it was impossible to miss two imposing new offerings from General Dynamics European Land Systems (GDELS). These are the newly displayed Infantry Fighting Vehicle (IFV) and Medium Main Battle Tank (MMBT), which are both variants of the ASCOD family. ASCOD is a joint programme developed by GDELS-Steyr and GDELS Santa Barbara Sistemas (GDELs-SBS). The ASCOD family of vehicles includes the Spanish PIZARRO, the Austrian ULAN, and the British Ajax, which will be used by the UK’s new Strike Brigades. General Dynamics European Land Systems’ (GDELS) vice president for engineering Jose Lineros said that the two new variants were the culmination of a 30-year development journey. The ASCOD range of vehicles leverage what GDELS calls its Common Base Platform “The concept I want you to take away from today, is one platform, all roles,” said Lineros. The concept behind the CBP is that every vehicle shares a lower hull, driver station and track design. Everything else, including weapon solutions and the role or mission of the vehicle (ambulance, command post, APC, forward observer) can be tailored round this basic design. “We can put whatever weapon solution we may think of,” said Lineros. GDELS says the CBP reduces the vehicles’ logistic footprint and supports “cross-national” vehicle manufacturing and interoperability between different military users to foster greater defence co-operation amongst European countries. Lineros said the three core priorities of the ASCOD family were extraordinary survivability through a highly mine-resistant floor (which features footrests for crew inside the vehicle), outstanding mobility and a good standard of payload. The design can accommodate “projected manufacturing,” which means parts can be assembled in different places to suit the needs of the customer. 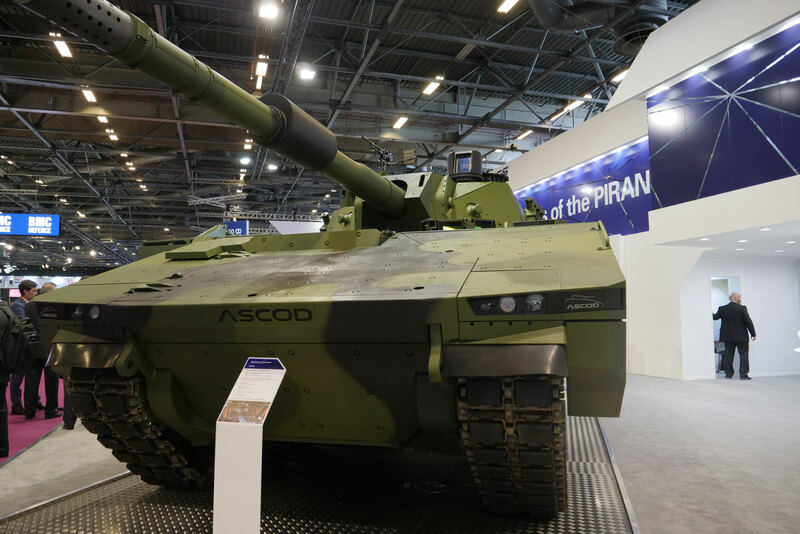 Having developed an Armoured Personal Carrier Variant (APC), with three crew members and eight dismounts, GDELS used Eurosatory to debut the MMBT, which Lineros said was distinguished by its mobility and the fact that it had the firepower of a Main Battle Tank. The IFV’s armament is totally flexible depending on the needs of the customer. With this baseline family of vehicles established, Lineros said GDELS now had the foundations to develop the ASCOD family with all the extra variants needed for modern land warfare, including command post, forward observer, bridge launcher, engineering, ambulance, artillery, repair and recovery. ASCOD comes at a time when armies across the world are recapitalising their armoured vehicle fleets. Prominent examples include Project Land 400 Phase Two in Australia, in addition to various programmes in Eastern Europe. Also, armies are seeking to reduce costs through economies of scale by avoiding duplication. It seems that with this offering, GDELS is providing yet more choice in an already crowded market.